Let’s not mince words; the reason you can’t seem to squeeze any productivity out of your meetings is probably because you’re flying blind with them. Don’t take that personally, though. Most people in your organization are in the same boat as you. That is, they have absolutely no idea how to host an effective meeting. Blogger Sarah Cooper has offered up a list of awesome tips to help you seem smarter and pretend you’re a meetings mogul, but what about if you’re trying to do more than just look better? What can you do to fix meetings within your business? How can you transform them from painful, boring slogs into the powerful moments of collaboration everyone’s telling you they can be? Only host meetings when you absolutely need to: Before you consider hosting a meeting, take a look at this handy flowchart (courtesy of time management coach Elizabeth Grace Saunders). Assuming your core reason for meeting isn’t half-baked and you make it to the end of the chart, go ahead and make the preparations – you can use this checklist to do so. Otherwise, it’s back to the drawing board. Meetings need to have a specific, defined purpose in order to be much more than a waste of time. Have an agenda – and stick to it: If you’re going to actually keep everyone at a meeting on-task and come out of it with something of value, you need an agenda. Lay out your meeting’s core issues in the order that they’ll be addressed along with the suggested processes, and necessary preparation. Most importantly, set an end time, and stick to it – constraints breed creativity, after all. 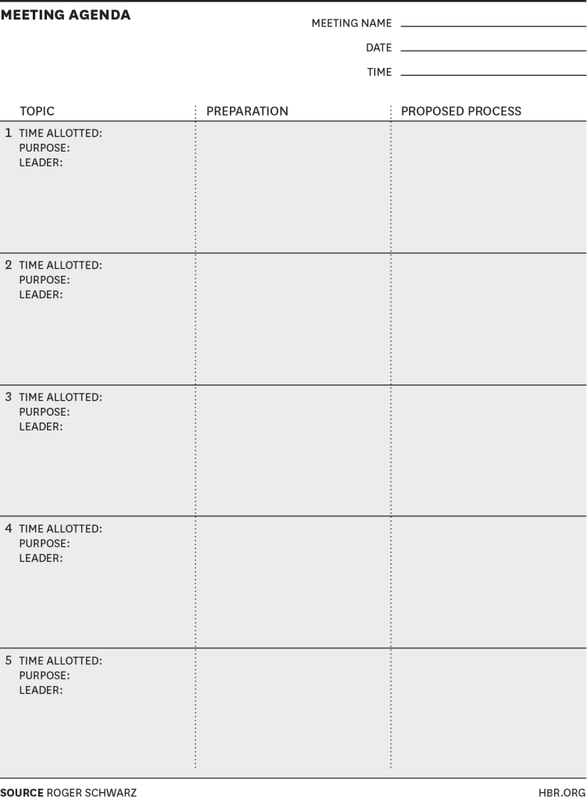 Here’s a great sample agenda put together by Harvard Business Review and inspired by meetings expert Roger Schwarz. Avoid visual clichés: Another valuable piece of advice from HBR is to stay away from clichés – both spoken and visual. Coming up with unique metaphors and analogies is vital if you’re to keep people interested. Try writing out a few ideas on paper, and see what you come up with. Understand the difference between presentation and conversation: Should people in your meeting converse, or present? It’s important that you know the difference between the two, explains speaker, writer, and CEO Nancy Duarte. Presentations are great for when you need to inform or persuade, but conversations are better if you’re looking to engage with an audience or develop ideas. Take meetings online: According to Harvard Business Review, online collaboration is sometimes better than doing things face-to-face. This is especially true if you need to bring in outside talent or are working with a geographically-diverse team. In cases where a face-to-face meeting isn’t necessary, talking things out online could be exactly what you need. Use the right meetings platform: Last but certainly not least, if you’re hosting a meeting online, then you need to make sure you’re using the right meetings platform. It needs to be easy to deploy, but more importantly, it needs to be intuitive to use. BBM Meetings is both. It makes virtual meetings a breeze by eliminating needless conference IDs and replacing them with single-button sign-in. It’s fully compatible with Android, iOS, and BlackBerry 10 devices and Windows PC and Mac, allowing attendees to easily collaborate via HD video and audio, message one another and share screens/content. 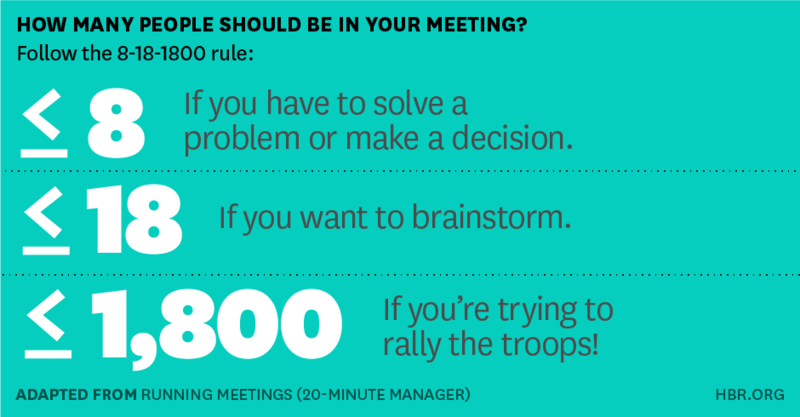 If you’re like most employees, then you could probably improve your performance in meetings. Don’t fret – there’s still hope for you. Simply follow the advice outlined above, and urge others within your organization to do the same. Check out The Mobile Collaborator’s Guide to Wasting Time and Sapping Productivity for some tips to getting the most out of your meetings. You’ll be rolling through meetings like a pro in no time. BlackBerry and T-Mobile’s Renewed Partnership Praised by Media Ever Wonder How BlackBerry Secures its Proprietary Network?